Welcome ... I grow your people, who grow your business, who grow your profits. Concentric Pumps Ltd is a market leader in the design and production of pumping systems to off-highway vehicles. 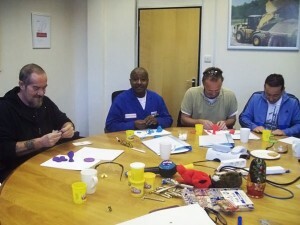 The company in Birmingham have for several years followed a Business Excellence Programme using the EFQM model. A part of this programme is the commitment to continuously develop their leaders: “ Develop a shared leadership culture for the organisation and review and improve the effectiveness of personal leadership behaviour” and to be able to fulfil its Values. The plan for 2010/2011 included leadership development training for the ‘High Potentials’ and Team Leaders. A development programme was designed for delivery over a 10 month period to the 2 target groups specifically chosen for the Programme. The first stage of delivery consisted of 1-2-1 sessions to elicit individual development needs. This was followed by a series of monthly half day sessions focusing on bringing together the organisation’s and individual’s needs. A mid programme 1-2-1 review to objectively assess progress to date. At the conclusion of the Programme, a final 1-2-1 took place to monitor the performance against the intended outcomes. The final stage of the Programme consists of a presentation by the individuals to the Senior Management Team. The individuals have been supported throughout the preparation of these presentations by both Kate Rigby and the Business Excellence team at Concentric. Kate and the team at Concentric have worked closely together to ensure that the Programme achieves all of the intended outcomes and that the individuals attending the programme have felt constantly engaged and supported in their own development. Kate has taken us through the journey from Inspired Amateurs to Competent Professionals. Learning about how we are perceived by our colleagues, how we can influence them by developing our inter-personal skills and how to get the best out of our people by understanding necessary skills needed both in functional and cross functional teams. Kate helped us to realise our full potential and equip us with a toolbox of leadership skills. The Development Programme also delivered a range of benefits to individuals through a depth of understanding, awareness and confidence. The organisation benefited from the engagement within teams and productivity. One of the most powerful elements of the programme was the style of delivery which was lively, interactive and motivational.